12 customers have given this product a 4-star rating. I bought this piano as a rehearsal piano that could throw into the back of the car or carry around town with minimal effort. The key feel great though they don't have hammer action. The sound quality of the speakers is basic but the sound through a PA or amplified system sounds good though a little thin. In the end I've gigged with it in a few places where the piano was being used as more of a background thing and it was dead handy. For the price, I am delighted with the Go-Piano and would recommend it to anyone who finds themselves moving a 20kg stage piano around for minor gigs. This is likely aimed at the beginners market and rightly so - it's battery powered and was (probably) bundled with tuition stuff. I like to play a few songs on piano at gigs and don't have a car so this was a compromise. We all like weighted keys but unsurprisingly weighted keys equals weight. This is LIGHT! I'm used to controller keyboards with pianoteq ran on logic so whilst the sound is not on that level - I definitely favour the sounds of this over the older Korgs and cheaper Yamaha's I've owned previously. 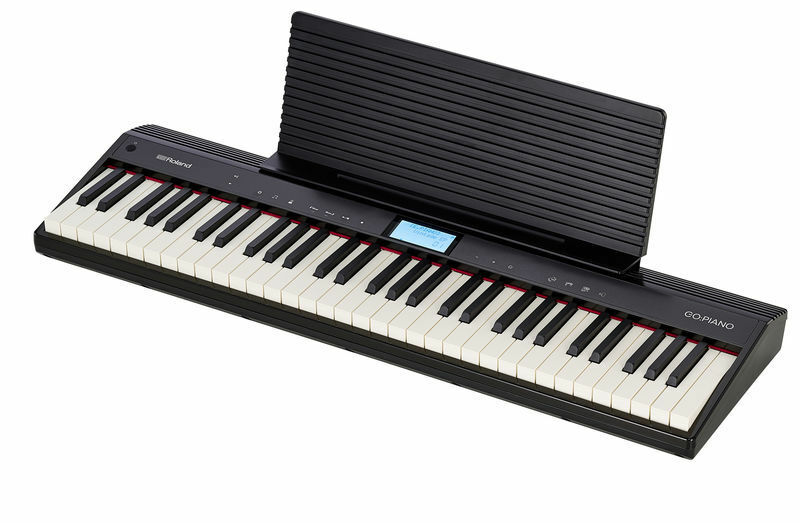 Comparing it to the similarly priced Yamaha NPs this has loads more features and I like that there are actually buttons rather than hold a function button and hit middle C or whatever. The Bluetooth feature I think will be useful for me to wirelessly run background music from my phone whilst I'm at the bar on a break! If I could change one thing it'd be to have control over the ratio of piano to strings rather than it just be one patch - but I'd still buy it again definitely - in fact I already have! ID: 416909 © 1996–2019 Thomann GmbH Thomann loves you, because you rock!